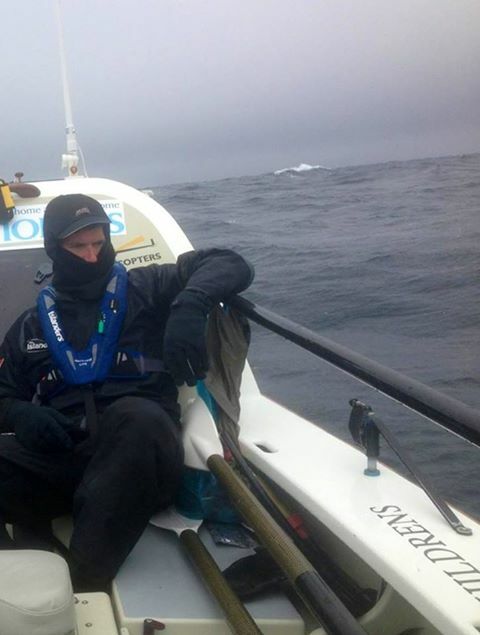 Chris Usborne, Race Director spoke early this afternoon to both crews in GBRow 2013 – the world’s toughest rowing race. Here is his blog on Savoir Faire and the Islanders. 13.15: I spoke to Jason McKinlay on board Savoir Faire for six minutes. Jason and his rowing partner Josh Tarr from Salcombe, Devon, are near the Irish coast, four miles north of Wicklow. Savoir Faire is French for know-how and this team is aptly named. Josh and Jason certainly had the know-how to successfully row through most of the night again last night – the second of two ‘horrible’ nights. Today they are heading towards Dublin and looking a spot to anchor tonight to wait out the storm that is predicted in the next 12 hours. Jason has been amazed at the ‘absolute beauty’ of the Irish coast, south of Dublin. They have also been impressed by their own performance so far after 11 days of rowing in their 2,000-mile journey around Britain’s mainland. 13.25 I then spoke to Josh Taylor, skipper of the Islanders. 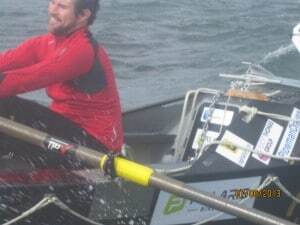 They began rowing again this morning after nearly 12 hours at anchor in a cove south of Belfast. They had headed there last night after winds gusting to force seven had been predicted for that part of the Irish Sea. As it happened the prediction was not completely accurate and the gusts only reached force five to six during the night. Seas that were seriously lumpy have died down during the day and the water is now flat calm and the wind is a light southerly. The next big decision facing the Islanders in Black Oyster is when to make the exposed crossing from Northern Ireland to the Mull of Kintyre off the west coast of Scotland. A storm is predicted within 24 hours, so they will spend that time hugging the Ulster coast until a weather window opens to make a dash to the west coast of Scotland. Skipper Josh says they will only make the crossing when all four crew members agree that it safe to proceed. One casualty of the bad weather was the crew’s GoPro camera which was lost overboard, along with amazing footage of the first ten days of this remarkable race.